Ebenezer was only seventeen when he stood on Lexington Common on April 19, 1775. He was not the youngest, however, as there were seven other seventeen year olds, four age sixteen and one fifteen. Just a few days later, Ebenezer joined with thirteen others who were on the Common to swear a deposition as to what had occurred there. Ebenezer became the first attorney to be admitted to practice before the Luzerne County courts in 1787. He was described as a prominent and successful member of the Bar and a respected citizen of the county. In May of 1788, he was elected Cornet of a “Troop of Light Dragoons,” and chosen to represent Luzerne County in the state legislature in 1793. He was served as a Burgess of the Borough of Wilkes-Barre from May 1824 to 1827 and served as the President of the Council from May 1809 to 1910 and again from May 1820 to 1823. He died in Wilkes-Barre March 1, 1829 at age 71.10 His gravesite is yet to be located. 1Charles Hudson, History of the Town of Lexington, Middlesex County, Massachusetts from Its First Settlement to 1868, Revised and Continued to 1812, Two Volumes, Lexington Historical Society, Houghton Mifflin Company, Boston and New York, 1913. Volume II, Genealogy, p. 47. 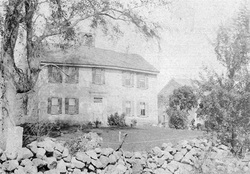 3Vincent Kehoe, We Were There, April 19th, 1775: The American Rebels, Vin Kehoe Enterprises, Chelmsford, MA. c1974 – 75, p. 89. 4 Charles Hudson, History of the Town of Lexington, Middlesex County, Massachusetts from Its First Settlement to 1868, Revised and Continued to 1812, Two Volumes, Lexington Historical Society, Houghton Mifflin Company, Boston and New York, 1913. Volume I, History, pp. 427-28; Massachusetts Office of the Secretary of State, Massachusetts Soldiers and Sailors of the Revolutionary War, A Compilation from the Archives, Seventeen volumes, Wright and Potter Printing Company, Boston, 1896, vol. 2, p. 350-51. 5Hudson, Genealogy, p. 47; Charles Bowman Dougherty, The Story of Bowman’s Hill, Wilkes-Barre, PA, Rarder Press, Wilkes-Barre, PA, 1912. 7Daugherty, pp. 10, 12, 16; Oscar Jewell Harvey’s” History of Lodge, No. 61, F. and A. and M.” published in Wilkes-Barre in 18975. 8Daugherty, pp. 10, 12, 32. 11National Archives and Records Administration, Post-Revolutionary War Papers RG94, Papers of the War Department1784 – 1800. The Bowman collection contains financial documents, correspondence, and essays related to the family of Samuel Bowman of Wilkes-Barre, Pennsylvania. Two early receipts, dated 1770 and 1771, pertain to the financial affairs of William Ledlie, Captain Samuel Bowman's father-in-law. Other receipts from the 1790s indicate Bowman's purchase of "twenty Gallons of Whiskey and one Cask," and a transaction involving a horse; one later financial document records an order for schoolbooks in 1809 made by Jacob Morris, a Revolutionary War colonel. Several legal documents throughout the collection document land holdings of the Bowman family, as well as additional fiscal matters; these include a sworn statement about Ebenezer Bowman's debts (November 10, 1821), a deed for land owned by the estate of Jesse Fell near Wilkes-Barre, Pennsylvania , and a notice of a pending lawsuit against William Ledlie Bowman (February 20, 1837). The collection also holds personal correspondence, including, among other material, one anonymous, religious letter (May 29, 1797), and an item about local military recruitment efforts (February 4, 1800). Among the additional materials are a celebratory essay written on July 4, 1825; an article about local lawyer Mr. Phillips, addressed to the editor of the Wyoming Herald; and an essay composed "On Nothing." Two short newspaper articles are appended below concerning Samuel Bowman, Ebenezer’s brother. 1Stephen E. Ambrose, Duty, Honor, Country: A History of West Point, Johns Hopkins Press, Baltimore, 1999; George Washington Cullum, Biographical Register of the Officers and Graduates of the United States Military Academyat West Point, New York Since Its Establishment in 1802,Houghton Mifflin, Boston and New York, 1891, p. 394.